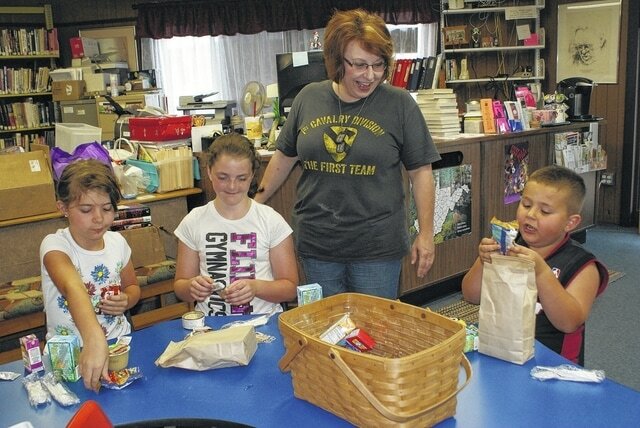 MASON COUNTY — Thirty children took advantage of the first day of a free lunch program being offered in three of Mason County’s library locations. Libraries in Point Pleasant, Mason and New Haven are offering the lunches to children and teens through 18 years, regardless of income. It is part of the library system’s “Read and Feed” program. On Monday, six children were served in the Mason location, 10 in New Haven, and 14 in Point Pleasant. One adult ate lunch at Point Pleasant, which is offered to anyone for $4. There are four lunch choices each day, including peanut butter and jelly, beef stick and cheese, chicken salad and tuna salad. Each lunch includes milk, juice, and a variety of trail mixes, crackers, apple sauce and other food items. A basket is provided at each location for children to swap what they do not like for something that they do like. Lunches are served in Point Pleasant Monday through Friday from 11 a.m. to 1 p.m. In Mason, they will be offered on Monday and Tuesday from 11 a.m. to 1 p.m., and Wednesday through Friday from 11 a.m. to 3 p.m. In New Haven, lunches will be served Monday through Thursday from 11 a.m. to 3 p.m., and on Friday at the New Haven United Methodist Church from 11 a.m. to 1 p.m. There will be activities for the children such as story time, crafts, and Lego days. Additional snacks like popcorn and popsicles will also be provided. Lunches for Read and Feed are provided through the West Virginia Department of Agriculture. Mason County’s sponsor is the Facing Hunger Food Bank of Huntington.